A frequent question from adult children is: When is the right time to move to Assisted Living? Although the services offered in Assisted Living can vary greatly from provider to provider, after more than 25 years in the industry, I still see three major reasons why seniors move. I call them the three P’s: pills, provisions, and precaution. Pills: Medication regimens can be confusing to all of us. 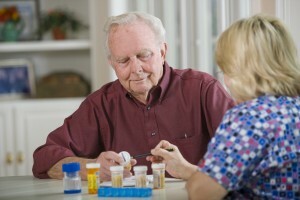 The average senior is on more than 10 medications at any one time. The odds of making an error with that number of medications is very high. Many times, adult children help their senior parents decide to move to Assisted Living because managing their medications and their side effects becomes too complex for the senior to manage without assistance. Medication mishaps can be very dangerous, even life-threatening, so moving to a setting where professional, caring staff can monitor this 24 hours a day is one reason to consider a move. Provisions: Managing a household is a chore for all of us. But, for seniors, it is even harder, especially when it comes to cooking. Preparing healthy, nutritious, tasty meals for one or even two people on a daily basis is challenging and eating out for every meal is costly. Weight loss or lack of adherence to a therapeutic diet, such as a diabetic diet, can be signs that your senior parent isn’t eating right. This is another great reason to consider Assisted Living; your mother or father won’t have to do the preparation or the clean-up and will have wonderful neighbors for enjoyable companionship while eating. Precaution: For some adult children, helping a parent decide on Assisted Living is a precaution. Maybe mom or dad had a fall or is at high risk of a stroke. Whatever the reason, the adult child would just feel better if someone was around 24 hours a day to “keep an eye” on the parent. The adult children may live close by or may have personal demands that keep them from being able to meet that need. That’s when Assisted Living is a great answer. Whatever the reason, if you are considering Assisted Living for your parent, please reach out to our professional senior advisors and The Watermark at East Hill. We will take the time to listen and make honest recommendations based on our experience. We are here for you.